For busy small businesses on the move to enterprise companies around the globe, Certify Travel offers a technology solution that can meet all your needs and make corporate travel easy. 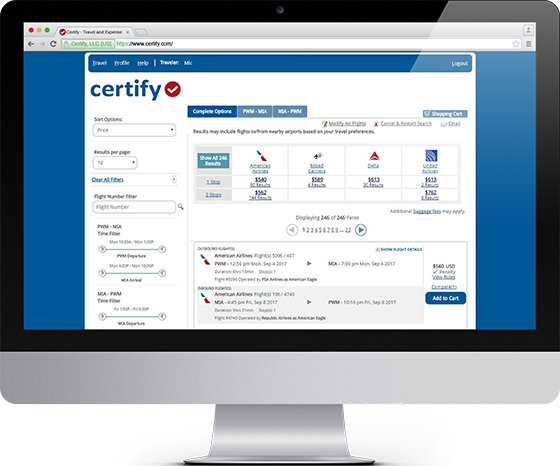 Whether you need an online travel booking service or a powerful new engine for your preferred travel management company, Certify offers a fully automated, seamlessly integrated travel and expense platform all backed by industry leading resources and support. Get the powerful product features and services every global business needs to thrive. Advanced travel policy enforcement, support for international travelers, duty of care functionality and single sign-on capabilities are just some of what's available. Certify Enterprise Travel also gives you the flexibility to integrate with any corporate travel agency or TMC as your ticketing provider of choice. Streamline the travel booking and expense management process and save your company money. 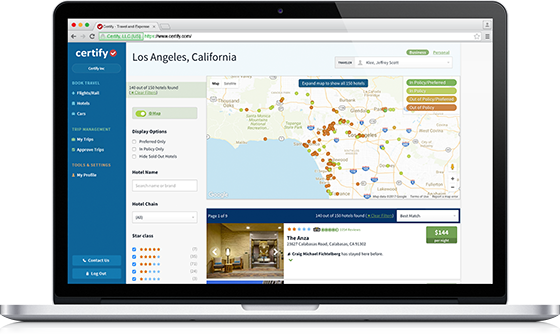 For employees, searching for flights, hotels, and car rentals is quick and flexible. And you'll know they're finding and booking only the most economical travel arrangements, as all option are defined by your specific corporate travel policy and based on the lowest available rates in the market. Is your company overspending on travel? Find out how your company's travel and entertainment spending compares to millions of expenses and receipts processed by the Certify system. Generate a customized infographic of your results side-by-side with benchmark spending data.